The Large Bird House, next to the Sea Lion Pool, was one of the first animal exhibit buildings at the Bronx Zoo, completed in 1905. (A few decades ago, it ceased to be a bird building and has been an office building since 1992.) 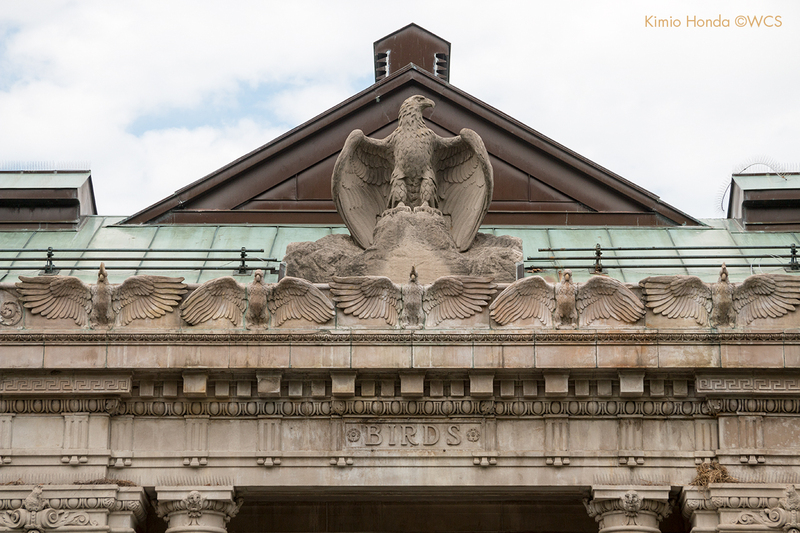 A sculptural eagle watches over each entrance to the building, standing above the cornice of cockatoos, while great horned owls spread their wings over the corners. It was Alexander Phimister Proctor who sculpted these wonderful birds out of stone after giving the same treatment to the Monkey House in 1903. Proctor and other artists were given extensive access to Bronx Zoo animals and facilities for such works. 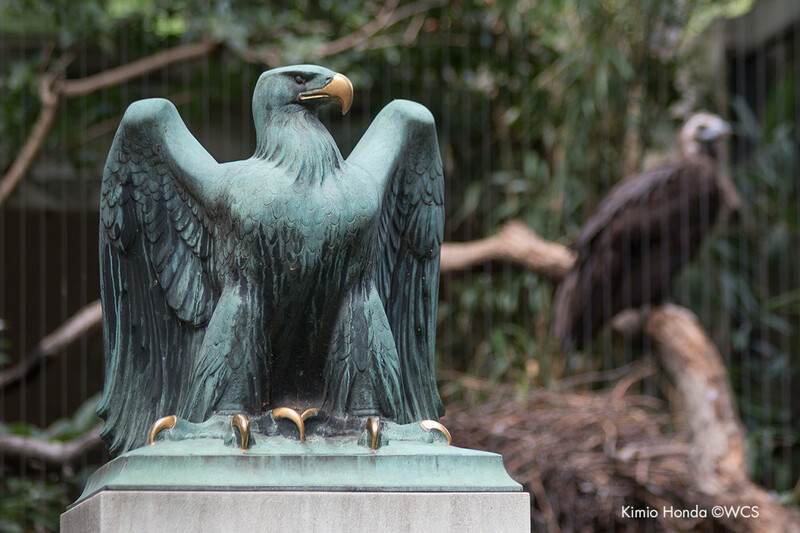 According to a story recounted in Political Animals: Public Art in American Zoos and Aquariums, by Jesse Donahue and Erik Trump, the Zoo’s first director, William Hornaday, allowed Proctor to keep a bald eagle at his home in Westchester for the eagle sculpture. One day Proctor was eating lunch and heard a scream. Someone attempted to steal the eagle, but instead the eagle caught the thief–with its talons and beak. In addition to the image of avian royalty, eagles have a special symbolic place in the United States, where the national bird is the bald eagle. In the summer of 1941, with World War II gaining intensity in Europe, the Bronx Zoo held an exhibition of eagles in art at the Zoo’s Heads and Horns Museum (currently the Education building). The exhibition lasted from July 2 through July 17, and according to the July/August 1941 issue of the Bulletin of the New York Zoological Society, an impressive 116,000 visitors attended the show. It featured works of all kinds, from sculptures to coins to ceramics, on loan from various museums and other collections. A couple of sculptural legacies from the show still remain at the Zoo. 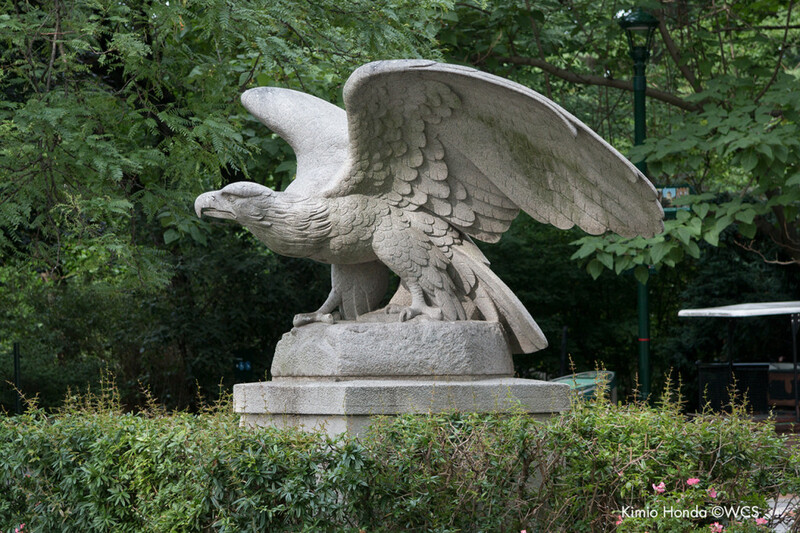 Eagle sculpture from the City Hall Post Office and Courthouse, now in front of the Bronx Zoo’s Education building. The granite eagle sculpture in front of the Bronx Zoo’s Education building is one of them, and it was the largest piece of the exhibition. The sculpture came from the City Hall Post Office and Courthouse, which was demolished in 1939. Another pair from the demolished building, with a little different attitude from those at the Bronx Zoo, went to the General Grant National Memorial (also known as Grant’s Tomb). 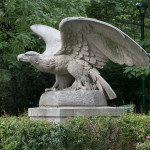 Paul Jennewein eagle sculpture in front of Bronx Zoo’s Birds of Prey exhibit. This is very interesting because the eagle sculpture at the Rochester war memorial is completely different from the one at the Bronx Zoo. In addition, the bronze sculpture that stands on a pedestal in front of the Zoo’s Birds of Prey exhibit bears the year 1952, eleven years after the art exhibition. One available account has it that this piece was a recast, replacing the original that suffered weather damage. However, based solely on its appearance, it is my conjecture that the model for the Rochester war memorial could not be replaced after damage, and instead the current bronze piece was cast from a scaled plaster study for the 8-foot eagle sculptures that guard the western end of the Arlington Memorial Bridge (1935). Before the Arlington Memorial Bridge, Jennewein had sculpted a nearly identical pair of eagles in 1929 for the gate of the US Embassy in Paris. During the research for this post I discovered that the sculpture is briefly but prominently featured in one of my all-time movie favorites, Charade. In the conclusion of the movie [spoiler alert! ], the two protagonists played by Audrey Hepburn and Cary Grant come to the Embassy. 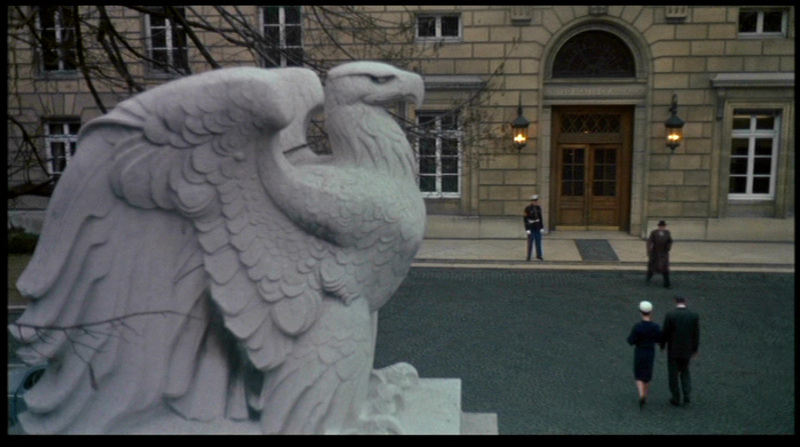 The camera watches after them as they step in the building, with one of the eagles occupying about a half the screen in the foreground. Eagle sculpture in Central Park Zoo courtyard. The eagle in front of the Education building and the Jennewein eagle remind me of the eagle sculptures in the Central Park Zoo courtyard around the Sea Lion Pool. The NYC Department of Parks and Recreations website indicates that the Central Park Zoo eagles came from an overpass in Bay Bridge, Brooklyn. 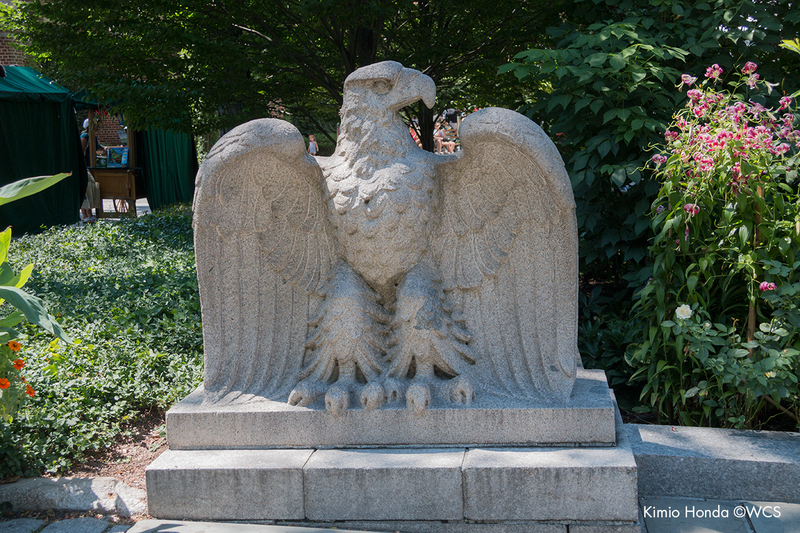 Curiously the bridge was demolished in 1941, the same year of the Bronx Zoo’s Eagles in Art exhibition, but it appears that the sculptures were brought straight to the Central Park Zoo. I created. Many thanks for your research. I love these articles! Keep them coming.